A quiet night in for Dr. Charlie Harris (Michael Shanks) goes haywire after nurse Kristine Fields (Nicole Underhay, MURDOCH MYSTERIES) shows up at his door drunk. After Kristine ends up in a drunk-driving accident, it’s Dr. Alex Reid (Erica Durance) who wants to know what happened. Struggling to save her life, Charlie and Alex must work together and put their feelings aside to help Kristine, even as her Spirit does all it can to cross over. Meanwhile, an overweight former patient of Dr. Maggie Lin’s (Julia Taylor Ross) arrives complaining she’s having a heart attack, but all surgical signs point to medical malpractice and Maggie’s career is left on the line as she struggles to clear her name and save her patient. In the ER, Dr. Zach Miller (Benjamin Ayres) helps Dr. Dev Sekara (Dejan Loyola) contend with matters of the heart as they treat a heart-broken patient for nail-gun injuries after a DIY renovation goes wrong. 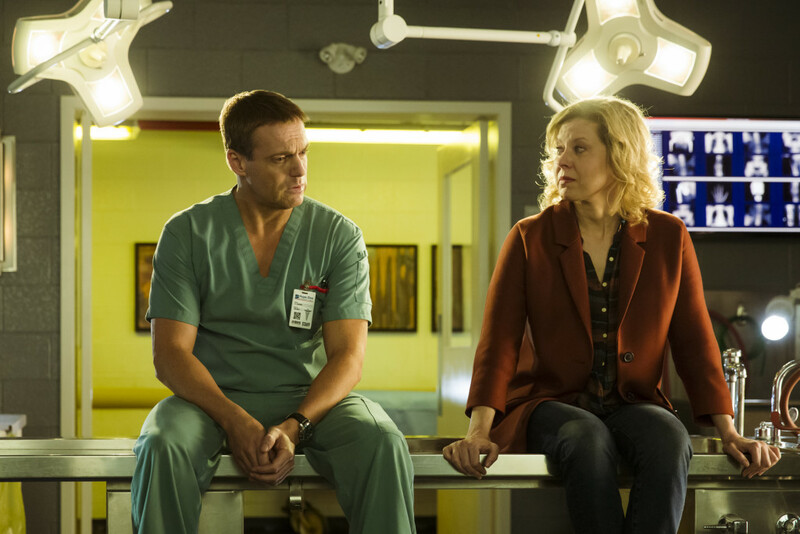 “Goodbye Girl”, Saving Hope‘s 13th episode, will air January 14, 2016 on CTV at 10 pm ET/PT. Check out the preview images.